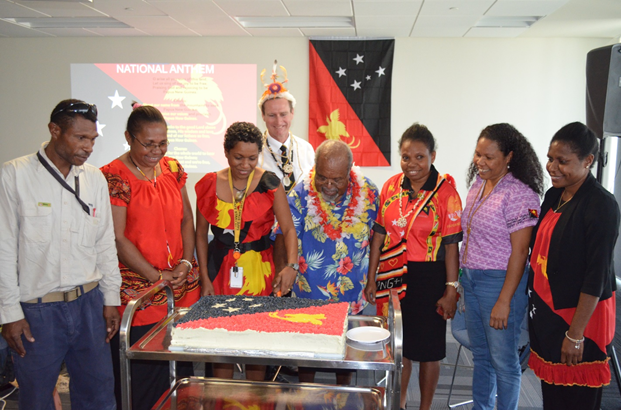 ExxonMobil PNG Limited, operator of PNG LNG project was proud to host PNG’s founding father Grand Chief Sir Michael Somare on Thursday 14 September at the PNG LNG head office during their week-long Independence anniversary celebrations focused on ‘PNG’s growth and development’. The Grand Chief spoke about the years leading up to the country gaining its Independence, highlighting the important gesture of courteously taking down the Australian flag on Independence eve, before hoisting the PNG flag on 16 September 1975. The Grand Chief also inspired the approximately 300 staff with his personal tales as a boy. He encouraged them to make the most of the opportunities that come their way. Pictured above is Grand Chief Sir Michael Somare cutting the independence cake with several ExxonMobil staff and Managing Director Andrew Barry (back).